Fredericksburg is an independent city in the Commonwealth of Virginia located 49 miles (79 km) south of Washington, D.C., and 58 miles (93 km) north of Richmond. As of the 2010 census, the city had a population of 24,286. The Bureau of Economic Analysis combines the city of Fredericksburg with neighboring Spotsylvania County for statistical purposes. 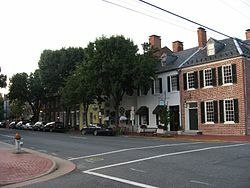 Fredericksburg is part of the Washington Metropolitan Area. Fredericksburg is home to several major commercial centers including Central Park (as of 2004, the second-largest mall on the East Coast) and Spotsylvania Towne Centre, located in Spotsylvania County adjacent to the city line. Major employers include the University of Mary Washington, Mary Washington Healthcare, and GEICO. Many Fredericksburg-area residents commute to work by car, bus, and rail to Washington DC, Fairfax, Prince William County, and Arlington, as well as Richmond. This has led to Fredericksburg becoming more culturally synonymous with the rest of Northern Virginia. As interest in the frontier grew, the colonial assembly responded by forming a new county named Spotsylvania (after the governor) in 1720 and establishing Fredericksburg in 1728 as a port for the county, of which it was then a part. Named for Frederick, Prince of Wales, son of King George II, the colonial town's streets bore the names of members of the royal family. The county court was moved to Fredericksburg in 1732, and the town served as county seat until 1780, when the courthouse was moved closer to the county center. Fredericksburg was incorporated as a town, with its own court, council, and mayor, in 1781. It received its charter as an independent city in 1879. The city adopted its present city manager/council form of government in 1911. The city's development and success was based on other significant residents, enslaved Africans with varied skills, who were critical to its growth. "Slaves worked on plantations, on the docks, in iron industries, mining and quarries, mercantile businesses, construction, domestic services, and others were skilled blacksmiths, coopers, cobblers, and draymen. African Americans were vital in the development of the area." During the 19th century, Fredericksburg sought to maintain its sphere of trade but with limited success. It promoted the development of a canal on the Rappahannock and construction of a turnpike and plank road to bind the interior country to the market town. By 1837, a north-south railroad, which became the Richmond, Fredericksburg and Potomac Railroad, linked the town to Richmond, the state capital. A much-needed railroad joining the town to the farming region to the west was not finished until after the Civil War. After the war, Fredericksburg recovered its former position as a center of local trade and slowly grew beyond its prewar boundaries. The University of Mary Washington was founded there in 1908 as the State Normal and Industrial School for Women. Adopting the name of Mary Washington College in 1938, the college was for many years associated with the University of Virginia as a women's liberal arts college. The college became independent of UVA and began to accept men in 1970. Recently, the college changed names from Mary Washington College to the University of Mary Washington. Two separate campuses for graduate and professional studies and education and research are located in suburban Stafford County and in rural King George County near the Dahlgren naval base, respectively. According to the United States Census Bureau, the city has a total area of 10.5 square miles (27 km2). None of the area is covered with water. The city is part of the boundary between the Piedmont and Tidewater regions, and as such is located on the fall line, as evidently seen on the Rappahannock River. US-1, US-17, and I-95 all pass through the city, which is located approximately 49 miles (79 km) from Washington, D.C.
Fredericksburg has a four-season humid subtropical climate (Köppen Cfa), with slightly cool winters and hot, humid summers. Note that some of the statistics for the city center may be different than what is presented below due to the park location of the station used. In the city the population was spread out with 17.8% under the age of 18, 23.8% from 18 to 24, 27.2% from 25 to 44, 18.4% from 45 to 64, and 12.8% who were 65 years of age or older. The median age was 30 years. For every 100 females there were 81.8 males. For every 100 females age 18 and over, there were 78.4 males. In the 2008 Presidential election, voters in Fredericksburg gave Barack Obama a total of 64.33% of the vote. Only Arlington County, Alexandria, and Falls Church had a higher percentage of votes for Obama in the Northern Virginia region. A GOP presidential candidate has not carried Fredericksburg since 1988. Within the historic district, four 18th-century historic sites are run by Preservation Virginia: the Mary Washington House, where George Washington's mother spent her final years; the late 18th century Rising Sun Tavern and the Hugh Mercer Apothecary Shop (the fourth is only open on Historic Garden Week). Sites from the 19th century include the James Monroe Law Office Museum. Important public buildings include the 1852 courthouse designed by James Renwick, whose works include the Smithsonian Institution's castle building in Washington and St. Patrick's Cathedral in New York City, and the 1816 town hall and market house. The latter building now houses the Fredericksburg Area Museum and Cultural Center. Another site of interest is St. George's Church. Notable 20th-century sites and structures include the campus of the University of Mary Washington (begun in 1911), and Carl's Ice Cream, an Art Moderne roadside ice cream stand on the National Register of Historic Places on Route 1. The University of Mary Washington, established in 1908 and opening in 1911, is a four-year public university within the city. Fredericksburg's daily newspaper is The Free Lance–Star. The Free Lance was first published in 1885, and competed with two twice-weekly papers in the city during the late 19th century, the Fredericksburg News and The Virginia Star. While the News folded in 1884, the Star company began publishing the Daily Star in 1893. In 1900, the two companies merged, with both newspapers continuing publication until 1926, when they merged under the present title. Since that time, the Free Lance–Star has been owned and operated by members of the Rowe family of Fredericksburg. In television, Fredericksburg is served locally by Washington, DC TV networks, including WRC-TV, WTTG, WJLA, WUSA, and NewsChannel 8. Fredericksburg and the nearby region have several radio stations, including (on the FM dial) WWED (89.5, Christian), WJYJ (90.5, Christian), WFLS (93.3, country), WGRQ (95.9, "SuperHits", licensed to nearby Fairview Beach), WWUZ (96.9, classic rock, licensed to nearby Bowling Green), WVBX (99.3, "The Vibe", rhythmic contemporary, licensed to nearby Spotsylvania), WBQB ("B-101.5", adult contemporary) and WGRX ("Thunder 104.5", country, licensed to nearby Falmouth). Fredericksburg AM stations include WFVA (1230, nostalgia) and WNTX (1350, talk, news, and sports). WGRQ and WGRX are owned locally by Telemedia Broadcasting. WFLS, WWUZ, WVBX, and WYSK are owned by the Free Lance–Star Company. In 2001, the Arbitron media service began listing the Fredericksburg area as a nationally rated radio market. As of the fall of 2005, the area ranked 154th out of 297 markets surveyed, with a total market population of more than 280,000. Large broadcast companies like Clear Channel Communications and Cumulus Broadcasting are not active in the local market; almost all of its stations remain locally or regionally owned. There are no professional sports teams in Fredericksburg, however, there are a number of amateur and academic teams. Sports at the secondary education are run through the Virginia High School League. On the collegiate level are the University of Mary Washington Eagles. Other amateur athletics include the Fredericksburg Hotspur[ of United Soccer Leagues Premier Development League (PDL); and the Rappahannock Rugby Club a senior men's rugby club competing in Division III of the Potomac Rugby Union.